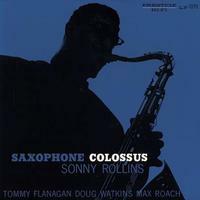 One of the pivotal recordings in bringing about the widespread acceptance of Sonny Rollins as a major figure, Saxophone Colossus inspired critics to write scholarly analyses and fans to revel in the hard-swinging invention, humor, and tender-strength balladry. Up to this album, while most musicians recognized Rollins as one of the new influential forces in the jazz of the ’50s, most critics were carping at Rollins or damning him with faint praise. "St. Thomas," a traditional West Indian melody which Mal Waldron remembered as "The Carnival," was recorded by many artists after Sonny introduced it here, and it remains a jazz standard today. The contributions of Tommy Flanagan’s elegant swing, Doug Watkins’s steady lift, and Max Roach’s most musical accompaniment and soloing (hear "Blue 7") make this a landmark album. Customer Reviews (5.00 Stars) 6 person(s) rated this product. This album is making me fall in love with my system all over again. Brilliant material, masterfully presented. You probably know this album so you might be wondering how this pressing sounds. Excellent! I've never owned the mono release and it swings. The QRP pressing that I received is flawless and as with all the other Prestige mono releases that I have bought the album cover is beautiful and the record sounds terrific. Thirty dollars is a bargain for such a first class release. This is the best sounding version of this that i own, having not heard the 45 RPM, of course. I can only explain how wonderful this sounds...it is like Sonny and crew with you in your room!! That good.. these new re-issue's rock!! Buy it!! The vinyl is dead quiet and no cracks or pops!!! QRP rocks the house!!! !